Hopes of attracting new business development were high on the minds of Trustees as they approved the hiring of consultant Greg Moberg last Tuesday evening, January 24. Moberg was chosen from a number of consultants responding to the Town’s search, after receiving a matching grant from Colorado’s Department of Local Affairs to help fund the rewrite of the town’s building code, known as the Land Development Code (LDC). Although the current LDC was adopted just ten years ago in 2007, it has long been thought to be a cause of frustration and unnecessary red tape for both prospective builders and also for the town staff trying to aid them. Terms of the $25,000 grant from DOLA require the town to match the funds equally, a sum that was included in the current 2017 budget when it was approved in December. Also required by DOLA is a finish date of August 31, 2017, so the rewrite process will begin immediately. Moberg, who was present at Tuesday’s meeting, answered questions from Trustees prior to their approval of his contract. He explained a basic timeline to include meetings with stakeholders in the project as well as a series of meetings to gather public input and feedback throughout the seven-month process. He also expressed his belief in the goals of the project and agreed with the assessment of the current code as being cumbersome and confusing. Trustees agreed unanimously to approve Moberg’s contract, giving the go-ahead to the start of the rewrite immediately. Also approved at Tuesday’s meeting was a change in the Conditional Use Permit (CUP) for the Colorado Alternative Health Care center at 125 Peach Avenue. Current owner/operators Jesse and Desa Loughman were requesting a move of the growing operation within their current premises. 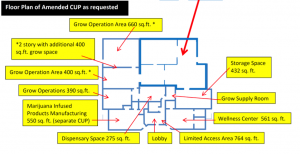 There will be no additional marijuana plants being grown, the grow area is simply being moved within the current building to take advantage of space that has become available due to a previous tenant moving out of the space. The current license of Colorado Alternative Health Care issued by the State of Colorado allows such a remodel, and Jesse Loughman explained to Trustees that the move was simply an internal reorganization to streamline their process. The CUP change request had been recommended to Trustees by a unanimous vote of the Planning Commission after a public hearing on the matter at their January 9 meeting. Trustees voted unanimously as well to approve the Conditional Use Permit change. Town Administrator Rich Sales gave an update on the Palisade Plunge project. There had been some confusion after a meeting between Grand Junction City Council and COPMOBA (Colorado Plateau Mountain Bike Trail Association) last week, with Grand Junction seeming to be ready to deny permission to develop the highly anticipated mountain bike trail down the front of the Grand Mesa into Palisade. The trail would pass through the Grand Junction watershed, and there were some concerns about other leaseholders on the same property. Sales was able to alleviate some of the concerns of Trustees but still requested their signatures on letters of support for the project to the Grand Junction City Council. The letters stress how important the project is to our community, as well as being on Gov. Hickenlooper’s list of important trails to be developed or finished as part of the ‘16 in 2016’. Two new members of the Tourism Advisory Board were approved by trustees, John Sabal of the Palisade Café 11.0, and Ryan Robinson of the Powderhorn Mountain Resort. Sabal has served in the past as chair of the Palisade Chamber of Commerce Board and is active in many community activities. Robinson is Marketing and Sales Manager at Powderhorn. Both were received enthusiastically by members of the Tourism Advisory Board when introduced at their January 10 meeting. 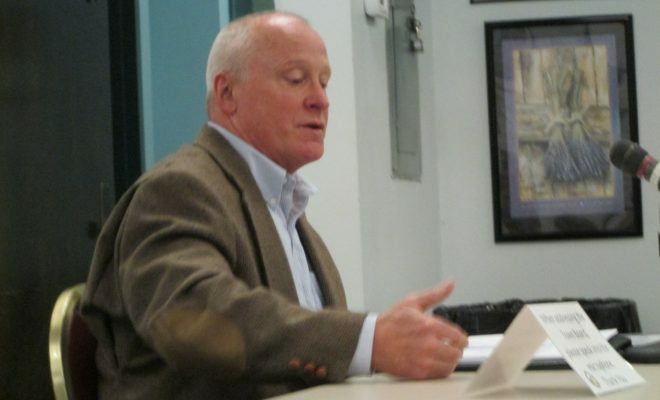 Mayor Roger Granat also re-assigned some of the Trustee positions as ex-oficio members of the various volunteer boards and committees to give each of them more experience with the different issues facing the town. Trustee Susan L’Hommedieu was moved from the Chamber Board to the Planning Commission, Trustee Robynn Sundermeier moved from the Planning Commission to the Parks and Rec Board, and Trustee Thea Chase moved from the Park and Rec Board to the Chamber of Commerce Board. The next meeting of the Palisade Board of Trustees is scheduled for Tuesday, February 14, at the public meeting room of the Civic Center at 341 W. 7th Street at 6:00 p.m. All meetings are open to the public and an agenda is posted on the town website at www.townofpalisade.org and posted at Town Hall at least 24 hours before each regularly scheduled meeting. Formerly the manager of the Palisade Tribune, Betsy moved to Palisade in 2009 after spending almost 35 years in Breckenridge. She has three grown kids, two in Colorado and one in Idaho. A die-hard Palisade booster, Betsy is also a big fan of the Palisade High School Bulldogs.